We are proud to make all of our products using premium Swiss chocolate manufactured from cocoa beans purchased from traceable sources and grown using sustainable practices throughout its production chain. We know people who love chocolate are justifiably concerned with ensuring their purchases help promote an equitable and sustainable life for the people who grow cocoa beans. This is an overview of the processes and programs being supported when you purchase our chocolate. It's important to note that although the term "fair trade" is used generically, it's in fact a specific certification given by certain organizations. 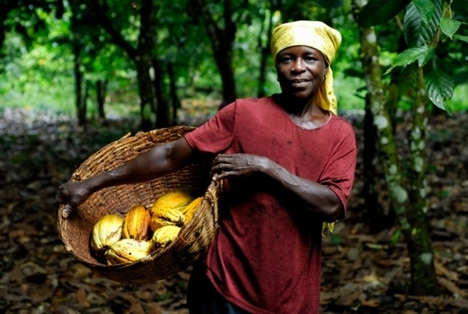 Fair Trade often refers specifically to the fair market price paid to cocoa farmers for their product. Sustainability encompasses the principle of fair prices paid but goes further to promote good agricultural practices, biodiversity, the elimination of child labor and investment in improving the quality of life for farmers, their families, workers and their communities. The manufacturer of the chocolate we use to make our products uses a model where every step in the growth, harvest and sale of the cocoa beans they purchase is addressed with independently-verifiable sustainability practices. Traceability is simply knowing where the cocoa beans originate when purchasing them. In some cases, even chocolate products such as bars labeled "fair trade" may be manufactured with only a small percentage of cocoa beans originating from certified farms due to the practice of mass balance. Mass balance is when cocoa beans from sustainable farms and those from uncertified farms are mixed in transit ending any chance for traceability. The chocolate we use is entirely traceable because the manufacturer purchases the entire output of farms within their sustainability model. You can be sure when purchasing Ü Chocolate for the World's products, you are indeed helping to promote a sustainable cocoa business with the farmers producing the beans. Training in new and improved agricultural practices. Training in good social, health and workplace safety practices. Training in good environmental practices to raise awareness of water source protection, ecosystem and biodiversity protection and waste management. A financing system to allow farmers to receive payments from carbon credits achieved through the implementation of good environmental practices. Establishment of Farmer Shops to allow growers access to inputs and equipment at competitive prices with flexible payment terms. This helps farmers increase the yield and its quality therefore helping to increase the growers income. Establishment of Village Resource Centres to provide access to computers, the internet and training resources. These also provide an educational resource for children, helping to promote the value of attending school. To help prevent malaria and its spread, specially treated nets are provided to farmers and their families. Creation of boreholes to increase access to clean drinking water. Labour conditions are audited and verified by independent third-party organizations that include Africert and IMO Control.